An old tool brings up a story………. I was using Pap’s loppers the other day, and had to stop to think of him. So I’ll blog this article again. Good old memories. 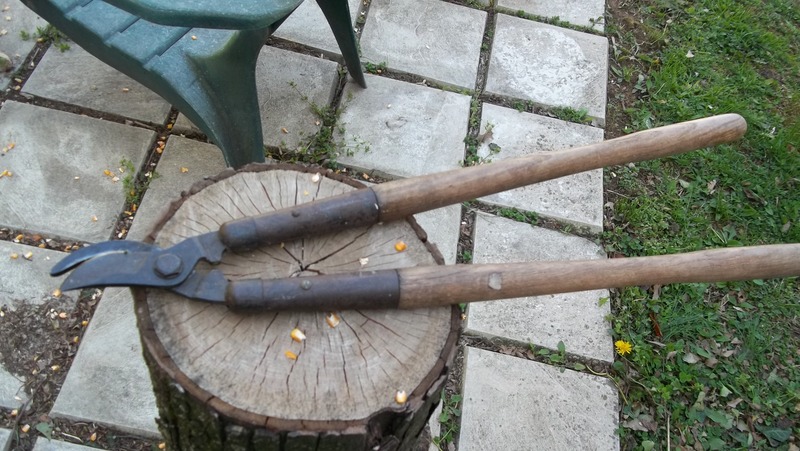 This pair of tree trimmers have always been called loppers in the family, more specifically Pap’s loppers. They would probably be about a hundred years old, cos Pap would be well over a hundred if he were living. I never really knew either of my grandfathers, so when I got married and my husband had this crotchety old grandfather, I was glad to get to know him. He used to sit and tell stories, and they were fascinating stories. Stories about the depression and about farming on a small scale, and about having to work very hard to feed his family then, and about how to grow things. I could listen to his stories all day.